Although the state of Florida does not tax a person’s estate upon his death, an estate is still subject to federal estate taxes. 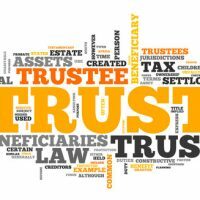 In order to avoid paying an excessive amount in estate taxes, essentially reducing what is available to be passed on to heirs, people may use various methods of estate planning and one such method is the use of a bypass trust. A bypass trust is a type of trust that allows the passing of property between a married couple in such a way that taxes are only paid on one of the spouse’s estates as opposed to each time each spouse dies. A bypass trust must have very restrictive terms despite its benefits, and must be drafted very carefully. Generally, each spouse can draft a will triggering the creation of a bypass trust upon his or her death and making the other spouse the beneficiary of the trust. The spouse who inherits property in a bypass trust has to be restricted from taking from the principal funds or property in the trust unless it is for a few purposes, such as health needs. A spouse who inherits property in a bypass trust is also restricted in how he or she may dispose of the trust upon his or her death. Usually, the spouse who creates the bypass trust can designate the beneficiaries to receive the benefits of the trust after the beneficiary spouse passes away. There was a time when bypass trusts were seen as the best way to avoid estate taxes for couples with high value estates. However, because there have been changes in tax law overtime, and spouses now have more flexibility when it comes to passing property between each other, most spouses do not really need to use a bypass trust. The threshold amount to trigger federal estate taxes is higher than it used to be, and the limit can be used between the spouses’ estates. So if a husband dies, and does not use the entire amount allowed under federal law to exempt his estate from taxes, the remaining amount is portable to his wife’s estate upon her death. There are also other tax benefits that the beneficiaries would lose from the property being passed through a bypass trust, such as avoiding capital gain on some of the property in the bypass trust. Even couples with high value estates should reconsider the use of bypass trusts due to the restrictions on the surviving spouse’s ability to use the property in the trust. If the spouse would like to keep some of the restrictions of a bypass trust, such as who would get the property after the other spouse’s death, there are ways to do this without relying on the bypass trust. A bypass trust should be drafted and set up by an experienced attorney with experience in estate planning. To learn more about trusts and bypass trusts in particular, call an experienced estate planning attorney from the Millhorn Elder Law Planning Group located in The Villages, Florida.